If you had not noticed, I’ve been on a baking bread mood for a while and that usually happens when a batch of bread that I’m making turns out great. It just makes me want to keep on baking until I get bored and move on to the next thing. I still remember how scared I used to be to make bread because I thought it was the hardest thing in the world. Working with yeast? Please, leave that to the experts. Pizza dough? Are you kidding me? Impossible. But of course, practice makes perfect, especially when you’re a self taught cook like me. I’m not going to tell you how many times I had to throw away a pizza dough because I simply could not get the hang of it. Turns out, I just needed to be more patient, just like with every other type of bread recipe. You have to take your time and warm your water to the right temperature, you have to let your yeast sit for a while so it can be fully activated and the most important thing, you have to knead that dough until it becomes bouncy and stretchy. I usually use my mixer to knead my dough because it’s way easier than doing it by hand, and of course, I always go for the easy route. However, in this video, I decided to show you how to knead it by hand so you can see that you don’t need a mixer to make it. It just takes some elbow grease, that’s all. Using a Stand Mixer: Mix water, dry yeast and white sugar in a small container and let it stand for about 5-8 minutes or until a foam forms on top indicating that the yeast is activated. Add flour and salt to the bowl of a standing mixer and whisk well. Add olive oil, the yeast mixture and warm water. Start mixing with the mixer's dough hook at low speed, then increase to medium speed and let it work the dough for about 8-10 minutes or until the dough is smooth and elastic. Process continues in step 7 below. Kneading Dough By Hand: Follow steps 1 & 2 above. Add flour and salt to a large bowl and whisk well. Add olive oil, the yeast mixture and warm water. Stir with a wooden spoon or spatula until the dough pulls away from the sides of the bowl. Place the dough on a flat, floured surface and knead with the palm of your hand for about 8-10 minutes. To knead the dough, fold it over and push down with the heel of your hand. Repeat this process during the entire kneading time. The dough is ready when it is smooth and elastic. Process continues in step 7 below. Grease a large bowl with olive oil. (You can use the same bowl you used to mix the flour). Shape dough into a ball and place it in the greased bowl. Cover with plastic wrap and let it rise in a warm place for about 1 hour. Tip: You can turn on a microwave for about 1 minute to warm it up and then place the dough inside. This will help it rise better. Place the dough on a flat, floured surface and divide it into two pieces to make two 14 inch (35 cm) pizzas. You can also divide it into four pieces to make four 7 inch (17.5 cm) pizzas. If freezing the dough: Shape each piece into a ball, wrap each one with plastic wrap and place the dough in a resealable freezer bag. You can freeze it up to 3 months. To use, simply thaw it out in the refrigerator and then shape it into your pizza crust before adding the sauce and cheese. 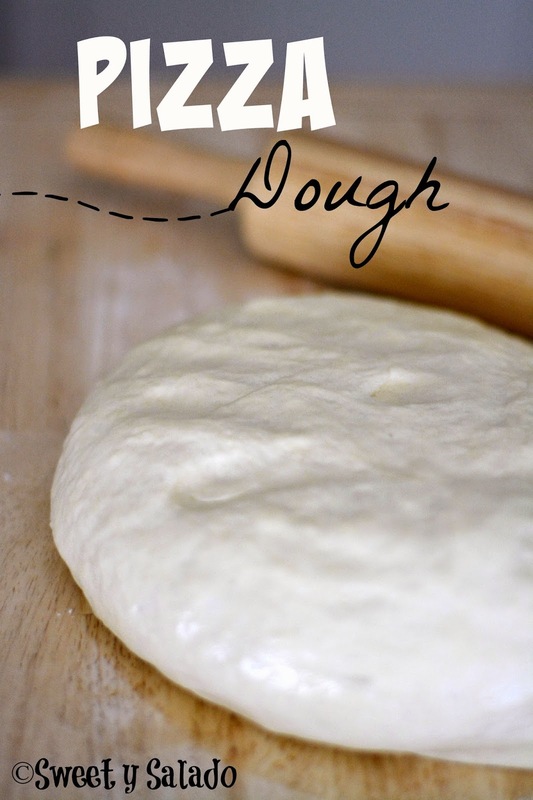 If using the dough right away: Shape each piece into a ball, place it on a cookie sheet, cover loosely with a clean kitchen towel or plastic wrap and let it rise in a warm place for 10 minutes. You can use the microwave method to help them rise. 7. 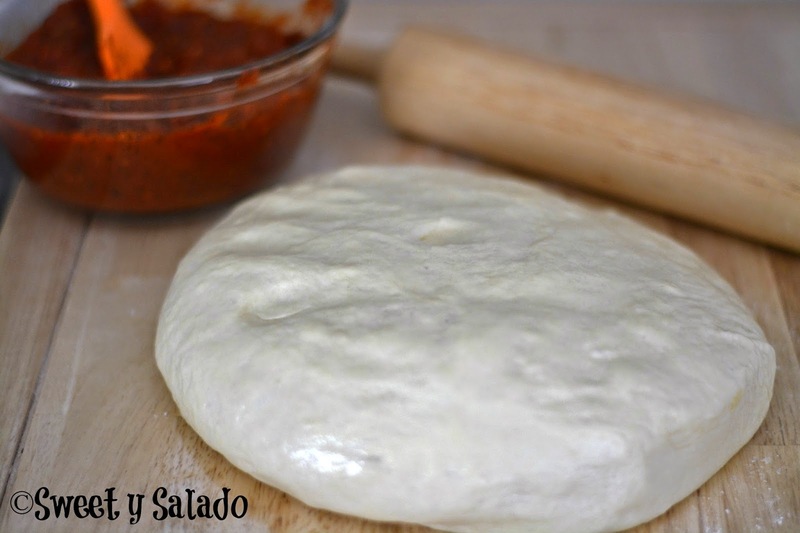 After 10 minutes, your dough is ready for making your favorite pizza.